This shawl is a full-sized circular Pi shawl for the intermediate to advanced knitter. Four different lace patterns build outwards towards a lace border. The name of the pattern comes from the lace stitches used. The fourth pattern is a stitch called Faerie Fire; the original design border uses shapes like flames to finish a shawl fit for the Queen of the Faeries. 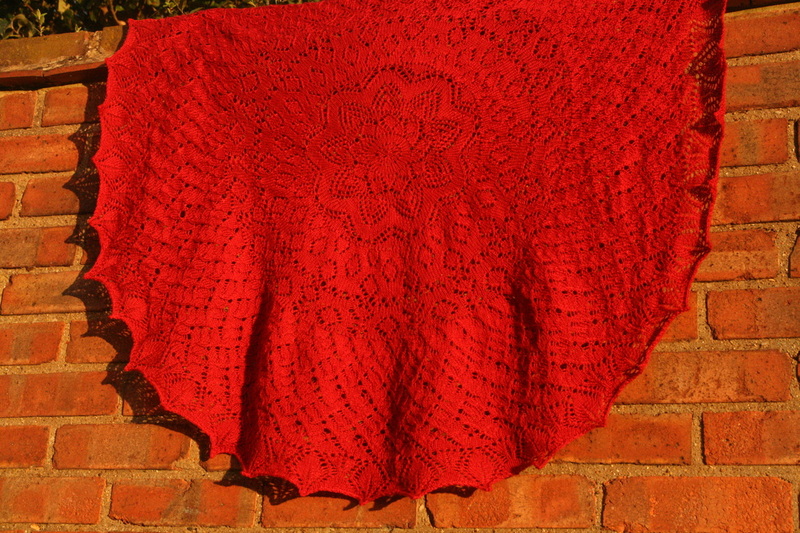 The shawl uses around 1150 yards of lace weight yarn. I recommend a wool yarn (or one with a good proportion of wool) that will block well. Finished shawl diameter after aggressive blocking is around 46”. Tension/gauge is not vital to this project, but to achieve pattern size one repeat of the first chart should measure 1.5”/4cm high and 1.5”/4cm wide. You will need 3.0mm (US 2.5) and 3.25mm (US 3) circular needles - I recommend cables at least 150cm (60") long. The pattern is charted only. There are no written instructions for the lace sections. You need to be able to: work a circular cast-on (links are given to online tutorials), work from a chart, work yarn-overs, single and double decreases.